Undisputedly the giants of German football, Bayern Munich have 27 Bundesliga titles, 18 DFB Cups and five UEFA Champions League crowns in their enviably bulging trophy cabinet. 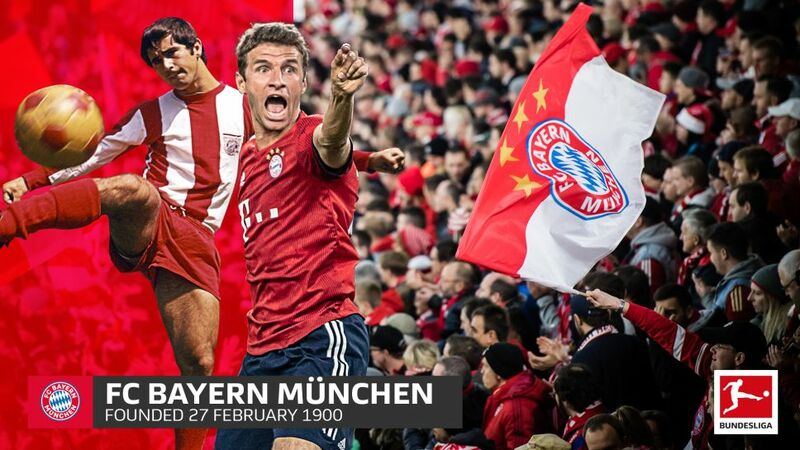 There is more to the Bavarians than 'just' being a highly successful football club, though. Here are 10 things about Germany's record champions, courtesy of bundesliga.com. Bayern are now the club with the longest unbroken presence in the Bundesliga, following the relegation of founding members Hamburg, but it may come as a surprise to many to discover that they were actually overlooked when the inaugural Bundesliga began. Back in 1963, 1860 Munich, rather than Bayern, were the city's dominant side. Having just won the Oberliga South, 1860 qualified along with four other teams from the division - including Eintracht Frankfurt and VfB Stuttgart - to form part of the newly founded Bundesliga, which brought together 16 clubs from the country's five regional leagues. Bayern were naturally disappointed. After all, they had come third in the Oberliga South that year - above Frankfurt, Karlsruher and Stuttgart - but the DFB only allowed a single representative per city, and so champions 1860 got the nod. Bayern would have to wait until 1965/66 before they won promotion to the top tier, although those extra few years in the Oberliga, as it turned out, would be a major blessing in disguise. With their finances in disarray, Bayern were forced to shed their expensive stars and go back to the drawing board, developing talented youngsters from the local region and forging their own youth system. Those players included the remarkable trio of Gerd Müller, Sepp Maier and, in particular, Franz Beckenbauer, who would have a profound impact on the club's development in the 1970s. Beckenbauer, Maier and Gerd Müller were the first but by all means not the last Bavaria-born talents to rise to the top of the game just a stone's throw from where they first saw the light of day. Indeed, not only is Bayern's youth academy one of the most prosperous around, it succeeds also in finding and nurturing players from within the region. Philipp Lahm was born in Munich and grew up in his family home in the suburb of Gern. He followed in Beckenbauer's footsteps by lifting the FIFA World Cup, while his 517 appearances for the club he first fell in love with when he was a ball boy at the Olympiastadion only sum up statistically the role he played at a club he joined at the age of 11. He was not the only local ball-boy-turned-terrace-hero, with Bastian Schweinsteiger also seeing the stars from behind the advertising boards, before becoming one on the other side of it. "It was always fantastic being up close to the pitch, watching the stars," he once said on Bayern's official website. "[Giovane] Elber, [Oliver] Kahn, [Jens] Jeremies, [Thomas] Linke, [Mehmet] Scholl – and a couple of years later, I was playing alongside them. I also watched them train as often as I could, after I’d cycled back from school to the club’s youth lodging. I recall once being the only person at the training ground, and I spent ages watching Owen Hargreaves all on his own, playing a ball against a wooden bench and trapping the rebound. He’d already signed a pro contract back then." Aware of the importance of this 12th man, Bayern hold their many fan clubs in great esteem, and regularly dispatch star players to spend time with supporters, especially during the Oktoberfest and in the run-up to Christmas. As well as committing to various social and charitable initiatives, the club also has a long history of solidarity with other German clubs in financial difficulty, having lent a helping hand to their old rivals 1860, St Pauli, Hansa Rostock and even Dortmund down the years. The club's policy of putting the fans first has also kept ticket prices down. Bayern may be one of the most successful football teams in the world, but it is still possible to get hold of a season ticket at the Allianz Arena for as little as €140, which works out at around €8 per game. In Munich, it really is fans first. Bayern do not do things by halves, and that also applies to their home stadium. As they started to outgrow the Grünwalder Stadion in the early 1970s, the decision was taken to move in as tenants at the Olympiastadion, built for the Olympic Games which were staged in the city in 1972. Considered as one of the greatest stadiums at the time, it served its purpose with almost 80,000 seats regularly filled, including for the final of the 1974 FIFA World Cup, until the next major event in Germany – the 2006 World Cup – prompted a move to their current Allianz Arena home.